There were five speakers on my panel, including yours truly. Here are my thoughts on what the others said. Dr. Supachai Panitchpakdi, Secretary-General of the United Nations Conference on Trade and Development, must have been part of the buzz-word contest I mentioned yesterday. Lots of rhetoric that theoretically was inoffensive, but I had the feeling that it translated into a call for more government. But maybe I’m paranoid SOB, so who knows. Professor Dato’ Dr. Zaleha Kamaruddin, Rector of the International Islamic University of Malaysia, was an interesting mix. At some points, she sounded like Ron Paul, saying nice things about the gold standard and low tax rates. But she also called for debt forgiveness and other forms of intervention. She explicitly said she was providing Islamic insights, so perhaps the strange mix makes sense from that perspective. Former Senator Alan K. Simpson also was a mixed bag. Simpson was co-chair of Obama’s fiscal commission, which I thought was a disappointment because it endorsed higher taxes and urged sub-par entitlement changes rather than much-needed structural reforms. He also went after Grover Norquist because of the no-tax pledge, which I think is a valuable tool to keep Republicans from selling out for bigger government. All that being said, Senator Simpson is a promoter of smaller government and he wants lower tax rates. So while I disagree with some of his tactical decisions, he was an ally on the panel and would probably do a pretty good job if he was economic czar. 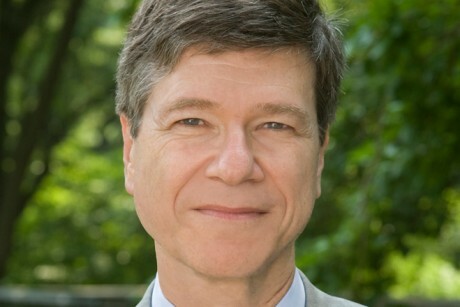 Last but not least, Professor Jeffrey Sachs of Columbia University was a statist, as one would expect based on what I wrote about him last year. We clashed the most, arguing about everything from tax havens to the size of government. Interestingly, we both said nice things about Sweden, but I was focusing on policies such as school choice and pension reform, while he admired the large public sector. But I will admit he was a nice guy. We sat next to each other and did find a bit of common ground in that we both were sympathetic to the way Sweden dealt with its financial crisis about 20 years ago (a version of the FDIC-resolution approach rather than the corrupt TARP bailout approach). My message, by the way, was very simple. Higher taxes won’t work. The “growth” vs. “austerity” debate in Europe is really a no-win fight between those who want higher spending vs. those who want higher taxes. The only good answer is to restrain spending with…you guessed it, Mitchell’s Golden Rule. I’m not safely out of New York City, and I promise I didn’t drink any of the Kool-Aid. I’m still a critic of international bureaucracies. And I wouldn’t allow myself to be bought off by a lavish, tax-free job at the United Nations. Unless, perhaps, it was a Special Envoy position with Angelina Jolie.